Sing Bingo Bonus | Get Your 120 FREE Bingo Tickets Here! Claim Offer – Get 120 FREE Bingo Tickets On 1st Deposit! With the slogan “Where Bingo Rocks”, Sing Bingo live up to it by providing you with a lucrative 120 bingo tickets to a giant £1,500 daily prize pool on your first deposit, plus access to some massive, high paying jackpot games. Getting started and claiming your bingo tickets couldn’t be easier. 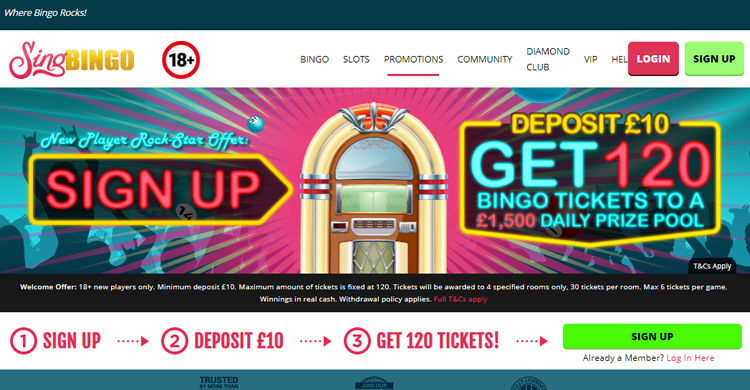 Simply click the button above, fill out the registration form, deposit a minimum of £10 and before you know it, you will have 120 bingo tickets sitting in your account. Please remember that all bonuses have T&C’s, as well as wagering requirements. So make sure you visit the official site for full details. 120 free tickets on your first deposit. 60 tickets on your 2nd deposit and 30 tickets on your third top up. Play free bingo games 24 hours a day. Win fantastic freebies with the Jukebox Jumble. The site features a superb selection of both 75, 90 ball and 5 line bingo games. There is everything from free games, penny games, pre-buy games and huge guaranteed jackpot games to choose from. New players will get access to a free bingo room for their first 24 hours with no deposit required. When you make your first deposit, along with your bonuses, you will also get access to the Make Your Debut room. This room dishes out a £10 jackpot every 60 minutes. You’ll also gain special entry into the Reload Tour game for 24 hours for a larger £25 – £50 prize every time you top up your account! There are many top slots games to check out, favourites include Fluffy Favourites, Cleopatra and Sugar Train. Thanks to their implementation of brilliant Dragonfish software, you will find lots of superb games with large jackpots. Definitely check out Fluffy Favourites, its a fun game with a £30,000 progressive jackpot. Melody Maker: Every Saturday at 10 PM. 50p ticket for a £3,000 prize pool. The Big Break: Every Monday at 9 PM. 10p a ticket, £500 jackpot. The After Party: Every Sunday at 9 PM. Cards are free if you topped up in the previous 6 days. Disco Divas: Every evening. 5p a ticket, £1,000 in prizes. Whether you are a big fan of karaoke, rock concerts or just a plain old fashioned bingo lover, you will feel right at home with Sing Bingo. The site is one of the largest and most popular around, probably because they have 3 free bingo rooms, dishing out real money prizes 24/7. Other massive perks include 120 free bingo tickets on first deposit and access to a huge variety of jackpot games. We see no reason not to give this site a whirl. Get started below and claim your free cards, test out the games and see what you think overall. If you decide to make this place your online bingo home, then make a deposit and start playing! If you have already played here, we recommend you check out the company’s sister site Costa Bingo.